March 16, 2010 - Rockwell Collins announced the successful certification of the its Pro Line 21 avionics, MultiScanTM Hazard Detection System, and the company's award winning Venue™ High Definition (HD) Cabin Management System (CMS) on the Cessna Citation CJ4 aircraft. 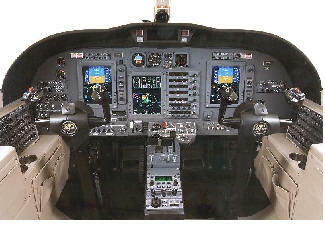 The certification occurred under a type certificate (TC) achieved by Cessna, a Textron company. "Cessna's successful certification of the CJ4 caps off years of ingenuity and development that have culminated in the debut of two Rockwell Collins solutions - our Venue HD cabin and our RTA-4100 MultiScan Hazard Detection System for business aircraft," Greg Irmen, vice president and general manager, Business and Regional Systems for Rockwell Collins. "We're proud of the standard this next generation business jet sets for both intelligent avionics solutions and passenger comfort." In the flight deck, proven technology of Rockwell Collins Pro Line 21 gives pilots powerful tools for situational awareness and operational efficiency. "With this certification, Cessna's CJ4s join the more than 4,000 Pro Line 21 equipped aircraft in the sky today," said Irmen. "As a member of our Pro Line family, these aircraft will benefit from some of our most advanced avionics solutions, our continued investment in system enhancements and our heritage of quality service and support." The Integrated Flight Information System (IFIS) enables access to essential information at a moment's notice, including electronic charts, graphical weather and enhanced map overlays. The aircraft's flight management system combines workload-reducing automation with true multi-sensor navigation capability to provide seamless takeoff-to-touchdown flight guidance including available full-profile vertical navigation. The Pro Line 21 communication, navigation and surveillance (CNS) system provides operators with highly reliable digital capabilities for future airspace operation. The CJ4 certification marks the first installation of Rockwell Collins RTA-4100 MultiScan Hazard Detection system on a business jet. "Bringing MultiScan to business jet operators is yet another way we can further enhance safety," said Irmen. "The system provides additional situational awareness by analyzing and determining actual weather hazards, not simply atmospheric moisture content, to provide flight crews more accurate weather returns." The system, which first appeared in the air transport market segment, is derived from extensive operational experience to create a fully automatic, hands-free airborne radar system that reduces pilot workload and enhances safety and passenger comfort by minimizing unexpected turbulence encounters, and provides optimal clutter-free weather displays. Venue, Rockwell Collins' is an integrated cabin management and entertainment suite, comes standard on the CJ4. The configuration includes a home theater quality media center device, with high-definition digital audio/visual distributor which is built into the forward equipment cabinet. It also features a programmable master switch featuring an OLED screen and integrated real-time flight status information. "Cooperation between the Cessna and Rockwell Collins teams has been outstanding through the entire cabin development effort," said Tommy Dodson, vice president and general manager, Cabin Systems at Rockwell Collins. "As our first application of Venue, we appreciate Cessna's input which helped improve the customization of the system for the CJ4. We're especially eager to hear what CJ4 customers have to say about the ability to deliver a cabin environment that mirrors today's most advanced office and home-entertainment environments."